Manufacturing industries including aerospace and automotive are rife with weighty equipment and heavy tools. Workers often find themselves needing to lift something too heavy for one person, or holding and operating tools for long periods of time. Stories of workplace injuries that happen when someone lifts an object in the wrong way or pulls a muscle from extended use of tools of machinery are not uncommon. For many youths and teens who are interested in these industries, these issues can make working in manufacturing seem less appealing. Savvy engineers, however, know that there is always a solution to a problem. Engineers at Lockheed Martin have developed the FORTIS exoskeleton to help combat workplace injuries, heavy lifting and poor ergonomics. The exoskeleton was brought to the 2016 USA Science and Engineering Festival to demonstrate the technology to kids interested in robotics and manufacturing. ENGINEERING.com had the opportunity to speak with Gavin Barnes, lead engineer for the FORTIS Exoskeleton program at Lockheed Martin. 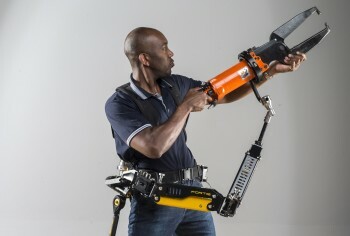 As Barnes describes it, the FORTIS exoskeleton is designed for industrial workers, maintenance and manufacturing personnel, as well as other jobs that require heavy lifting and tool operation. FORTIS is designed to share the weight of a tool in the same manner as calling over someone to assist you in lifting a heavy object. The exoskeleton structure can support tools weighing up to 36 pounds. By supporting the weight of the tool so the worker doesn’t have to, the worker can use the tool for a much longer period of time before needing to rest. Kids attending the Science and Engineering Festival reacted positively to the FORTIS Exoskeleton. “Honestly, they were usually awestruck with amazement,” Barnes said. “They’ve only seen these things in video games or movies. So here is this opportunity to finally see something in person and its showing them that this science is something that can be done and they can be a part of it. “The technology is there and ready for them to learn about, to use and to bring into their own lives,” Barnes continued. “It is pretty exciting to work with them and talk with them about it,” Barnes added. 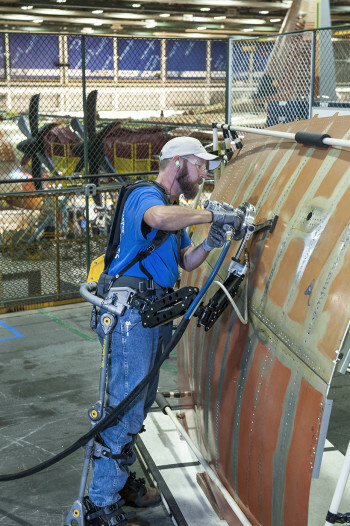 For more on the FORTIS exoskeleton technology, check out the Lockheed Martin website.